He actually brought a pressure cooker with him, when he was moving to Fontainebleau. At that time it surprised me, but now I do understand. If you really like dals and don't use a pressure cooker, you end up soaking something overnight each and every night. When it comes to any kind of legumes this magic vessel makes things way faster. So he would cook some dal he was in the mood for (I wasn't sure what it was made of at that time), pour it into a bowl, take a piece of fresh baguette and direct to his room. Then he would meet me (with my desperate hungry eyes) and generously offer me a try. Now I got that India has many dals - hot, thick and spicy stews made of different kinds of legumes. Some are more famous, some are less. 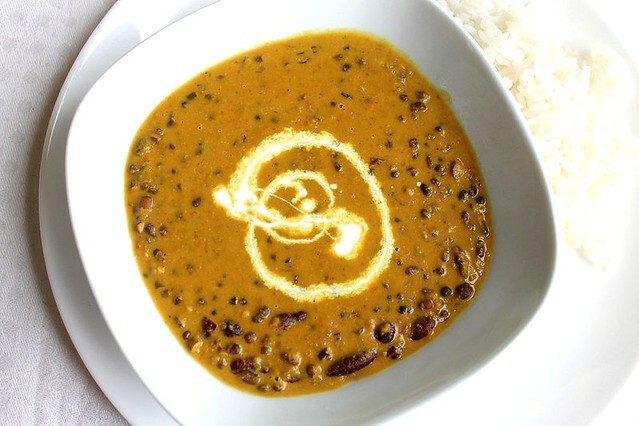 The two I mostly encountered in restaurants (in Paris, Singapore and Moscow) are dal makhani (a rich and dark dal, finished with heavy cream) and a simpler yellow dal (made of split peas). I first tried the proper dal makhani when my fried made it for the Indian dinner in the Insead culinary club. I started the club at the very beginning of our Insead year. It was food event based and two months down the road it grew really big. At that time my friend came up with an idea to get several Indian students together and cook a big dinner. It was a dinner for around 30 people, so the whole preparation process was insane. My friend and other cooks were working from early morning. There were multiple shopping rounds. Never in my life I chopped that many onions and garlic cloves at once. Throughout that day I got the most of my education about Indian food. The guys made raita, bhel puri (crispy salad made of puffed rice), chicken tikka, peas pulao, veggie uthappam (spicy veggie pancakes), mutter mushroom (peas and mushrooms in cashew gravy), mutter paneer (peas in paneer sauce), сholay (chickpeas in curry sauce), butter chicken and dal makhani. Never again I saw that much dal makhani. And no matter what I tried afterwards, dal makhani stayed my favorite Indian dish. Our recent dinner at Maharaja restaurant made me start craving for it again. Later in Singapore I got lucky to also learn to make different kinds of Indian bread at Palate sensations cooking studio. It would be beautiful if I made some paratha to go with the dal, but there is limit to what I can do in one day. So the bread stays in my to do list. All in all, dal makhani doesn't seem complicated any more. It is just long, not difficult. This VahRehVah.com video gave me a great deal of understanding how I could go about it. And (don't laugh at me) this Wiki Cookbook recipe I used to start off with basic proportions. The base of dal makhani is urad dal (black gram). The proper Russian translation is "черный маш" and it is available in Moscow from Indian spices store (so are all the necessary spices). It takes long to cook the urad dal if you are not using the pressure cooker (I don't have any). First you soak it overnight, then simmer for 4 hours. But it takes hardly any involvement from you. Involvement is needed later for 30 minutes or so - to make the dressing (of spices, tomato puree, butter etc). I have to say that throughout the cooking the dal looked nothing like the ready thing should be. But then over those last half an hour it magically transformed into real dal makhani, with its recognizable aroma and flavor. I felt really happy at that moment. It instantly became so accessible. Soak all of the legumes (urad dal, red kidney beans and chickpeas if using) in lots of room temperature water for 6 hours or overnight. Drain and rinse well. Transfer the legumes to a large saucepan and add 6 cups of water. Bring to a boil and simmer, partially covered for 4 hours (or till the urad dal is very soft). Check from time to time and add water if it boils dry. If you have a pressure cooker, you can use it instead to speed up the cooking (in this case you will need to increase the amount of water and adjust the cooking time). Pour the oil into a large pan set over medium heat. Add the cumin seeds and cook till cluttering. Add the whole garam masala and cook for some 30 seconds more. Add ginger, garlic (and onion if using) and cook stirring, till you feel the strong ginger and garlic aroma. Add the mashed tomatoes and bring to a boil. Add chilli powder, coriander powder, salt and turmeric (if using). Reduce the heat to low, cover and cook for a few minutes. Add the butter and cook till it is melted. Add the legumes together with the cooking water and bring to a boil. Add fenugreek, cover with a lid and keep cooking on very low heat for 30 minutes. Stir from time to time (otherwise the legumes will stick to the bottom of the pan). If time allows cook it longer than 30 minutes (for an hour or 2 - 3 hours), it will add to the flavor and aroma of the dal. In this case if it boils too thick in the process add a little water. Add cream and mix well. Bring back to boil, cover and simmer for another 5 minutes. Serve piping hot with steamed rice (basmati rice is best choice). My favorite way to make steamed rice without a steamer is described here. Yum! I am going to try your recipe!